The Thanksgiving dinner of my fantasies always begins with me wearing a string of pearls and freshly pressed apron, holding aloft a beautifully bronzed roasted turkey, glistening and golden from the oven in all its glory for all to see. My adoring family members’ faces are lit by flickering candlelight and they are hungry and beaming and admiring the gorgeous bird. I cut into the bird and it is succulent and juicy and perfect. All of the side dishes have come out of the oven at just the right time. The vegetables are colorful. Everything looks like a spread in Bon Appétit. Can you just see it? Isn’t it beautiful? Insert needle-scratch on a record…this is what Thanksgiving really looks like: I have bags under my eyes because I’ve been cooking non-stop for two days. The turkey, does come out of the oven beautiful and bronzed, however upon carving, I realize the breast meat is perfect and the dark meat hasn’t cooked thoroughly–thank you, weirdly calibrated convection setting. I’ve forgotten about the rolls in the oven and they have…caramelized. My brother is dressed in his finest Megadeth t-shirt and is poking my other brother in the head. My mother is smiling and shaking her head because she’s thinking that the turkey would have been perfect had I just cooked it in that roasting bag. It is then that I realize I’ve forgotten to shower. Thanksgiving for me always teeters on the brink of crazy. But at the same time, it is my all-time favorite holiday. It exhausts me, yet, I am reminded that this is why I cook in the first place. Thanksgiving is the first complex dinner that my mother taught me to make from scratch. Thanksgiving is my Super Bowl. It’s the day that I try to push myself a little, no, a lot harder in the kitchen than usual. There’s the push and pull of tradition versus my need to experiment and make something new. My brothers will complain and wonder why I didn’t make the stuffing the way mom always made it. They will wonder why on earth I decided to make “corn pudding”. I will wonder what made me think that I could bake bread from scratch. Sure, I could roast the turkey inside that plastic bag and it probably would be perfect, but what’s the fun in that? Honestly, I think I thrive on the wild thrill that things may go horribly wrong. Perhaps this is why I enjoy roller coasters so much…pondering this. Sometimes dinner is a win, sometimes not, but it is always a success, because everyone gives thanks and every one leaves happy and full–oh, so very full! So here’s my confession. No matter how well I plan; despite using all the advice and tips that columnists and bloggers give on how to make Thanksgiving effortless and sane, mine will never be that way. Because in that last hour, things go haywire. At some point, I’m dashing around squealing “I’m in the weeds!” to borrow from Top Chef-speak. And when all is said and done, I’m going to need a drink. My best-laid plans sometimes fall apart. And when things fall apart, there is always Fish House Punch. 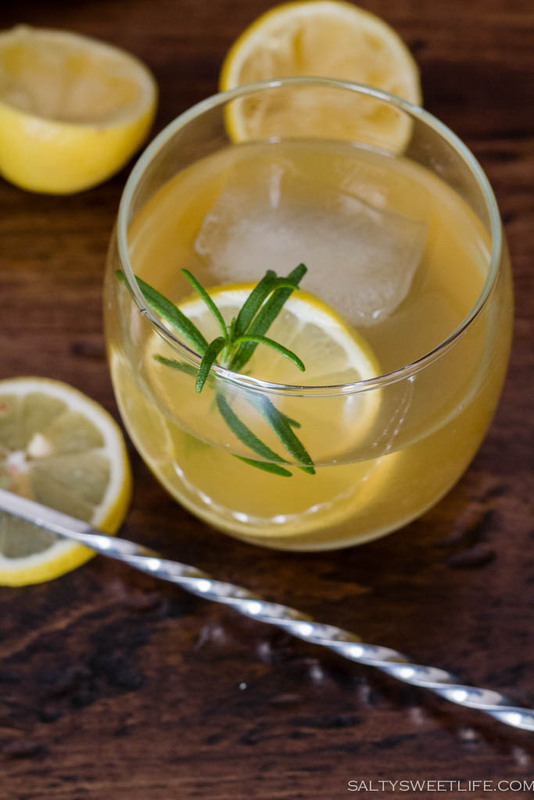 If there’s one thing I know about throwing a party, is that a good house cocktail will cover over a multitude of snafus and ease my frazzled Thanksgiving nerves. You can mix up this punch early in the morning and chill it in the refrigerator. Typically, an ice ring is a nice touch, but lately I’ve been making it lazy-girl style and adding large ice cubes to the punch bowl just prior to serving. 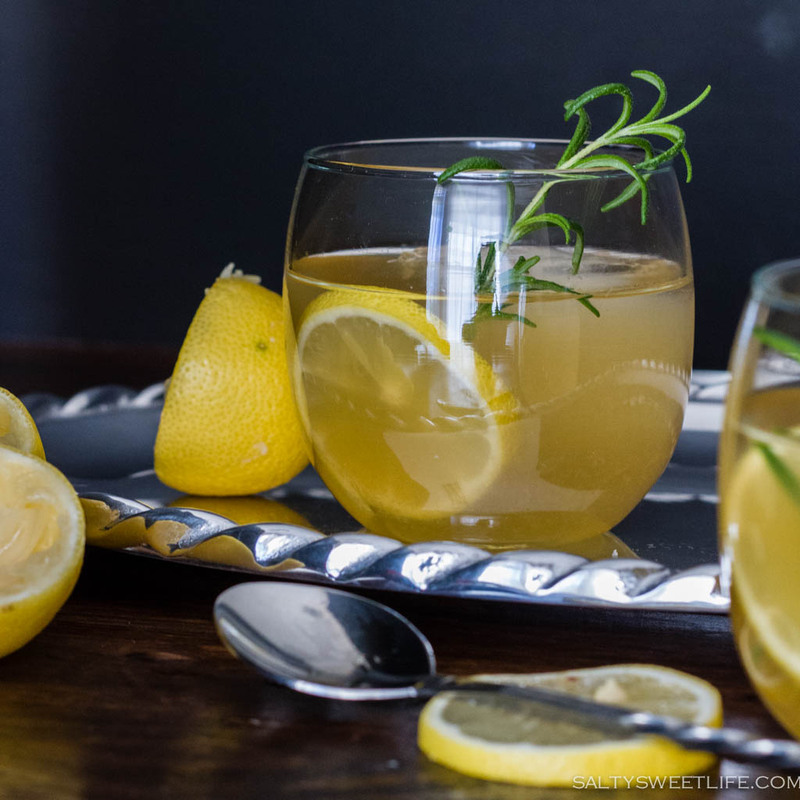 A holiday punch almost as old as Thanksgiving itself, Fish House Punch makes everything better. First of all, who doesn’t love punch? It’s boozy. It’s refreshing. Did I mention the boozy part? I served this punch last year and I don’t think I’ve ever had such a wonderful time at my own party! It’s a keeper and you should make it–it just might be the glue that holds it all together. Don’t let the term “punch” fool you–this is not your typical sweet, frothy punch. It packs a wollop from the heady mix of Jamaican Rum and Cognac. It’s so mellow, though, that you won’t even notice the alcohol…and that’s why it’s dangerous! Traditionally it was often diluted with black tea, but we like it full-strength here, because that’s just how we roll! Add the water to a saucepan over medium heat. Add the sugar and stir until the sugar is completely dissolved. Remove from the heat (there is no need to thoroughly heat this mixture, just heat enough to dissolve the sugar). 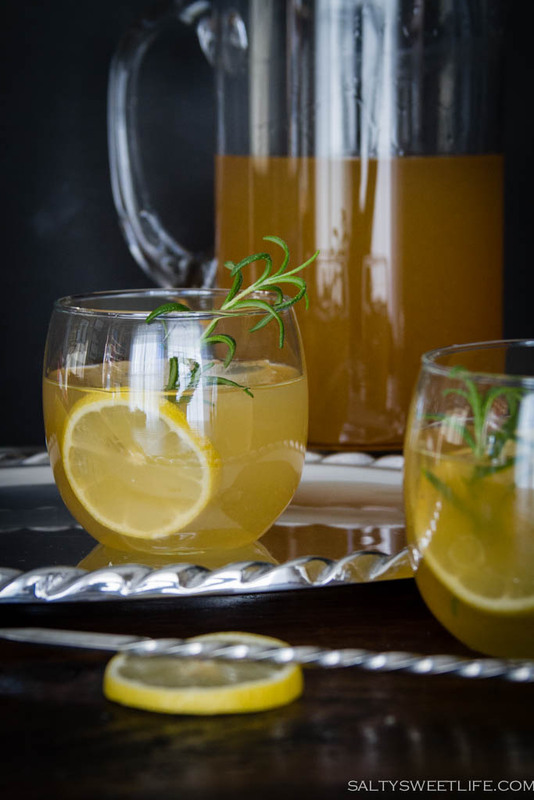 In a punch bowl or large pitcher, combine the rum, lemon juice, cognac, peach brandy and the sugar-water. Stir and refrigerate for three hours or at least one hour at a minimum. Prior to serving, add an ice ring or a large ice block to the punch bowl, or if you have enough to do and didn’t make an ice ring, just add some large ice cubes to the bowl. Garnish with fresh lemon slices. *Note: Last year, we ran out of refrigerator space to chill the punch, so we improvised and set the punch bowl in a cooler filled with bags of ice. Worked like a charm. I laughed out loud about the roasting bag! I love this season, but I have to admit, I have no problem going out to eat. Haha! Less pressure. Regardless, yes, to that punch! Yum! Lori, you are completely correct on the pressure thing! The thought has crossed our minds several times to go out of town for Thanksgiving, but we never do, because we’d miss all this “fun”! That punch is super charged! Libby! I’m so sorry I missed your comment! It went into the spam filter! Thank you so much for your kind words! I very nearly forgot to shower again, but I made it happen with less than an hour to spare! I hope you and your family had a wonderful holiday! You are hilarious! Loved this. Turkey shmurky, it’s all about the booze! Aww, Thank you Ali! I’m so happy you popped by! This looks amazing! I have a gathering to go to and think this will make a really nice contribution! I think you have a secret desire to be a mad June Cleaver? Hahaha!!! That sounds like a great Halloween costume!! If you make it, you’ll have to let me know how it goes! It will get everyone in a party mood! Thank you so much for stopping by, Lisa! I really appreciate that compliment and I’d really like to know what resonated with you? I hope you have a wonderful Thanksgiving! Quick, easy and tasty. A win, win! Thank you so much! Have a Happy Thanksgiving!